"There is little similarity, equally, between the way the Egyptians and the Sumerians visualized and personified their gods. Sumerian divinities were essentially human in appearance, and their attributes and their behaviour were merely the characteristics of humankind written large. The Egyptian gods were a great deal more complex and diverse. It appears that the earliest divinities were abstractions, represented by objects which had acquired a special sanctity. The most ancient sign for 'god', netjer, is abstract ; it is thought that it represents 'a staff bound with cloth'". - Rice, 2003, p.50. "... the immanence of the gods in nature, far from diminishing their significance for the Egyptians, enabled a correlation of human and natural life which was an inexhaustible source of strength. The life of man, as an individual and even more as a member of society, was integrated with the life of nature ..." - Frankfort, 1948, p.29. Impersonal natural elements and forces were used by the Egyptians to project the wills and actions of superbeings : the deities, a company of gods & goddesses. Invoked as a plural ("nTrw"), all divine beings were intended, but the singular form ("nTr") was also in effect. These superpowers were interrelated, and immanent in the phenomena of nature. They were these elements & forces. Each recognizable force corresponded to a deity, and the connotative semantic field of each god or goddess, reflected the archetypal symbols expressed in prayers, songs, dances, hymns & ceremonies, invoking natural and cultural phenomena. Hundreds of deities were thus at work, and the most important dealt with the greatest natural phenomena and the fundamental social relationships. Although the Egyptians used many images of animal-headed gods in their art, these were not an attempt to portray what the deities might looked like if they could be seen. Instead, these representations were large-scale ideograms, expressing in an image the force in question (Sekhmet, with a head of a lion, had the ferocity of the animal in question, Horus, the falcon, would soar over all other creatures, Anubis, a jackal, had very good senses, etc.). "... it would seem that animals as such possessed religious significance for the Egyptians. (...) We assume, then, that the Egyptian interpreted the nonhuman as superhuman, in particular when he saw it in animals - in their inarticulate wisdom, their certaintly, their unhesitating achievement, and above all in their static reality. With animals the continual succession of generations brought no change ..." - Frankfort, 1948, p.18. These deities or archetypal symbols of Egyptian religion, tried to mediate the subjective (collective unconscious) experience of natural & cultural elements & forces and to turn this to human advantage. Egyptologists (like Hornung or Allen) have compared the schematics of the interrelated Egyptian deities with our laws of physics. Both try to explain what the world is like and why it behaves the way it does, albeit in a different language and mode of thought. In essence, the Egyptian deities are omnipresent (immanent) in all of nature as life-powers (ka) and animators (ba), but always hidden (transcendent) in their spiritual essence (akh) and never alone, i.e. without divine company to entertain a continuous intra-divine participation (in triads, eneads, eneads of eneads, etc). Despite the variety of deities, the Egyptians conceived the origin of the world as singular. Only one god (Atum) was responsible for the emergence of the universe as a bubble of air in the vast, limitless, inert ocean and everlasting darkness of the undifferentiated primordial waters (Nun) that existed before creation. These waters continued to exist thereafter, for they surrounded creation in all directions and were characterized as an infinite flood ("HHw"). The various accounts of creation are less rival explanations, but rather different aspects of a single and uniform understanding of how the world came to be. In the Old Kingdom, the dominant view was developed by the priests of Heliopolis, and is therefore called the Heliopolitan creation account. It focused on the actual process of creation. Creation involved a single creator and the other gods as well. It occurred in "the time of the gods", also called : "the time of the god" or "the time of Re". 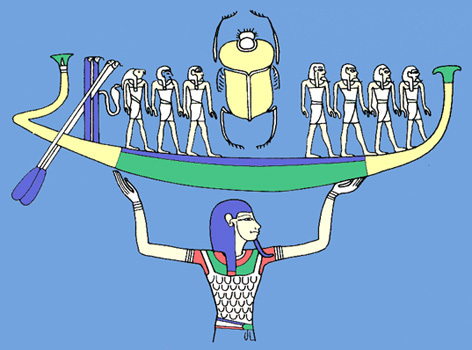 The evolution of Atum being the "first occasion" ("zep tepy"). It is essential to understand the Egyptians did not adhere to a Biblical creatio ex nihilo (a creation out of nothingness), but to ex nihilo nihil fit (out of nothing nothing comes). Everything emerged from a primordial, active singularity called "Atum" ("tm"), or "finisher". He is also called "Lord of All" ("nb tm") and also "Lord to the Limit" ("nb-r-Dr"). But before Atum "evolved himself", he pre-existed within the primordial water in a state of inert potentiality. He was alone with Nun, but "in his egg". Atum is Nun turned active (while Nun's inertia remains), Nun is Atum dormant (while Atum's potentiality remains). Both are thus "father of the gods". Diversity evolved from a single source. the time of the world : the created order (Maat) in general, and the unity of the Two Lands in particular. The birth of the Sun was the culmination of the generation, marking the end of creation and the beginning of the eternal cycle of life, which the Sun, as king of nature, regulated and made possible through heat and light. As Re is the culmination of Atum's "evolution", the two are combined in one (syncretism) : Re-Atum. The development of the fundamental myths, called hundreds of deities into being, each representing the elements & forcest "explaining" the recognized activities at hand. The phrase "Atum and his Ennead" implies Pharaoh Horus and the power of kingship. Indeed, in creation, Pharaoh was the central figure, for he was a god alife on Earth (and not yet in the sky). Although the evolution of Atum is explained in generational terms, in fact, creation happened all at once, namely, in the supreme moment when Atum evolved into the world (broke out of his egg) and time & space began. 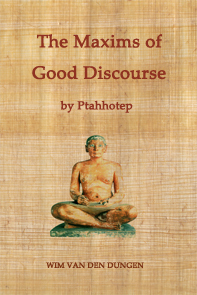 The Ancient Egyptians conceptualized the Divine in ante-rational terms. This means their patterns of thought were "concrete" and limited by a concrete context (place, time, person). 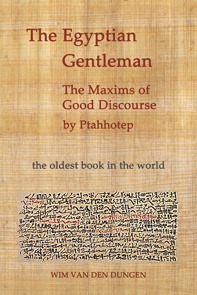 In the whole of Ancient Egyptian literature, there is no theory, no definition, no abstract, discursive activity to be found. It is amazing what can be thought, said and done without formal thought. 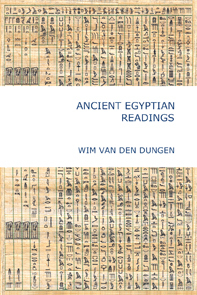 However, in these studies and whenever Egypt is implied, no capitals shall be used for words such as "divine", "god", "goddess", "godhead", "deity", "pantheon". Egypt's ante-rationality meant a multiple approach, characterized by a remarkable mixture of mythical and pre-rational strands (pointing to Predynastic, Early Dynastic and Old Kingdom religious activities), held together by a concrete, proto-rational intention (contextual and local). Before Pharaoh, the Egyptian of the Neolithic had recognized certain regularities, that is types. Water and the sky (the daylight of the Sun and the nightlight of the stars) played an essential role in these Predynastic times, and would continue to do so. The projection of transcendent meaning on types of figures repeating themselves frequently, may call into being the notion of a company of "gods and goddesses", superbeings, each with their own domains and in no way accountable to the others (cf. Santaria and vé-vé-voodoo). This atomistic polytheism was not the theology chosen by the Heliopolitan priests of the IVth Dynasty. Nor is it in accord with the unitary intentions of divine kingship (cf. the Early Dynastic "Followers of Horus", again a sky-god). Indeed, it is likely that already in Predynastic Egypt, an underlining unity had been conceived (cf. the role of the "Great Goddess of the sky"). Neither did Egyptian religion adhere to a radical monotheism (except in heresy - cf. Aten-theology), i.e. the notion a single creator created the all, being all alone, without any company. Although Atum was the sole "Lord of All" (without a second, and alone in the act of creating himself), his self-creation was simultaneous with the coming into being of Shu and Tefnut, his company, his family and niche of divine participation and solace (cf. the myth of the Single Eye, sent out because Atum had become weary by being too alone). The idea of a supreme god who is without a company never took root in the Egyptian mind. A notion like the Aten (worship of the solitary physical disk of the Sun), was rejected by the Egyptian mind as heretical and blasphemous. God could be anywhere and remain hidden. Egyptian henotheism understood existence as the result of the activity of a single creator together with his company. This underlined the phenomenon of intra-divine participation, the cooperative effort of all the forces and elements of existence. Although Atum was godhead and his company merely so many of his theophanies, each god and goddess "in his train" represented a clear type and manifested a series of collective psychic processes. The deities never interacted with humans, but only with other deities. The circle of divine participation was closed. So during its long history, Egypt moved from a loose henotheism (with, in the Old Kingdom, several national "godheads" like Re-Atum of Heliopolis, Ptah of Memphis, Thoth of Hermopolis and Osiris) to a strict henotheism (cf. Amun-Re of Thebes and Ptah initiated in the Middle Kingdom and developed in the New Kingdom). It never relinquished the pantheon, nor the sacred pictography of the "divine words", nor the essential fact that divinities only interact with other divinities. Egyptian syncretism and belief in one, universal deity, did however not initiate a movement towards the centrality and numerical exclusivity of monotheism. Divine unity was a matter of precreation and the act of creation, but not of creation itself. Creation was a fundamental conflict (bipolarity) which had to be kept together by addressing the archetypes of nature : the gods and their representative on Earth, the divine king. He was the sole guarantee the inherent duality of creation would not call in the end of the world. As the "son of Re", he was a "god on Earth", and so, being a member of Re's family, he could participate in the communion of the divine with the divine, which rejuvenated the "Two Lands" and made the institution of Pharaoh bless the unity of Egypt. With creation, Maat came into existence, and with her truth & justice came the necessity of a harmonious balance between the components of the universe. Were it not for Pharaoh, creation (as it were exhausting itself) would return to the original inert state of the primordial waters. Every morning the Sun could be eaten. Every year a famine could strike. Seth had been vanquished by the strong, but evil had not been removed from the weak. Life and stability were seen as an exception (an island) amid the vast expanse of limitless nothingness (an ocean). Moreover, creation was a political matter. The rule of divine kingship, represented by the Horus falcon and divine sonship, was the guarantee Maat would be returned to the creator Re and intra-divine participation between the divine father and his son would be fulfilled. Then this Pharaoh Horus NN would be a "son of man" (cf. Ptahhotep, Neferti & Ipuwer), but foremost the "son of god". On the one hand, rational henotheism does not accept numerical monotheism (there is only one, single deity). It proposes many deities. On the other hand, all deities are considered to be theophanies, expressions, attributes of One God(head), hidden, veiled and withdrawn ("Deus absconditus"). Hence, henotheism has left polytheism, which invokes entities as idols, i.e. as all-powerful, independent beings (a divine mob), but does not move towards monotheism, the exclusion of all deities, except one (cf. the first part of the Islamic "shahada" : "there is no god, but The God"). Greco-Roman religion was a classical example of rational henotheism. Hinduism and Taoism are good contemporary examples of rational henotheism. It makes sense to observe Egyptian henotheism had a lot in common with the Christian notion of the Trinity or the Sufi interpretation of the "Most Beatiful Names of Allah" : there is only one God, or essence, but this great He/She manifests as a variety of persons, or accidents (Divine Names or attributes). In Egypt, instead of only one trinity, there was a cascading manifold of such triads, a formal characteristic also found in Gnostic Christianity of the 2th century CE.